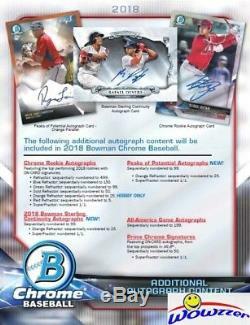 2018 Bowman Chrome Baseball Factory Sealed 12 Box HOBBY CASE-24 AUTOGRAPHS. We are Proud to offer this 2018 Bowman Chrome MLB Baseball Factory Sealed 12 Box HOBBY CASE! This Factory Sealed HOBBY Case includes TWELVE(12) Factory Sealed HOBBY Boxes! Each Factory Sealed HOBBY Box includes 2 Mini Boxes with 6 Packs and 5 Cards Per Pack in each Mini Box! 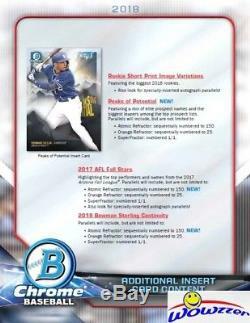 Each 2018 Bowman Chrome Baseball Hobby Box delivers (2) Autographed Cards, (1) Chrome Prospect Shimmer Parallel and (1) 2018 Bowman Sterling Continuity Insert Card in Every Box! Following Up On Last Year? 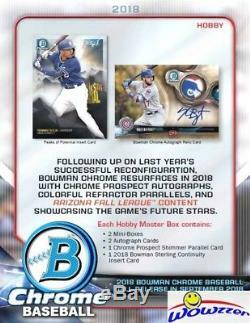 S Successful Reconfiguration, Bowman Chrome Resurfaces In 2018 With Chrome Prospect Autographs, Colorful Refractor Parallels, And Arizona Fall League Content Showcasing The Game? Each Hobby Master Box contains: - 2 Mini-Boxes - 2 Autograph Cards - 1 Chrome Prospect Shimmer Parallel Card - 1 2018 Bowman Sterling Continuity Insert Card. 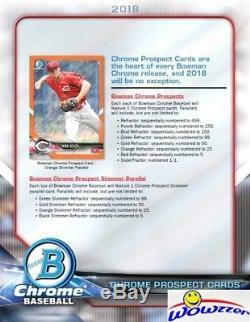 CHROME PROSPECT CARDS Chrome Prospect Cards are the heart of every Bowman Chrome release, and 2018 will be no exception. Bowman Chrome Prospects Each pack of Bowman Chrome Baseball will feature 2 Chrome Prospect cards. Bowman Chrome Prospect Shimmer Parallel Each box of Bowman Chrome Baseball will feature 1 Chrome Prospect Shimmer parallel card. 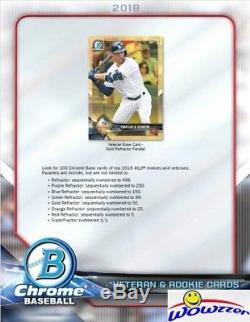 VETERAN & ROOKIE CARDS Look for 100 Chrome Base cards of top 2018 MLB® rookies and veterans. Rookie Short Print Image Variations Featuring the biggest 2018 rookies. Also look for specially-inserted autograph parallels! We stock a Huge Selection of Factory Sealed Boxes from every Sport! Plus the Largest Collection of Graded Cards in the World! Be Sure to Check out our 1,000? S of other Items for Sale. Wait to pay until all items have been won OR 7 days after oldest item was won. (Please Note - we are not open on the Weekends and Holidays). We will NOT list a lower value or mark orders as gifts. We answer all emails within about 24 hours, Monday through Friday, and work to resolve all problems as quickly as possible. Unless an item is damaged, it generally needs to be in the condition it was received, either undamaged or factory sealed, to be eligible for a return. Note on Factory Sealed Boxes and Cases and Graded Cards. S samples and are not guaranteed to be in any particular box or case. On Listing for Beckett BGS Graded Cards. We answer all emails within about 24 hours Monday through Friday. We are an Internet only company; we do not have a retail location. Get business information that counts! - Vendio Counters are active content free. 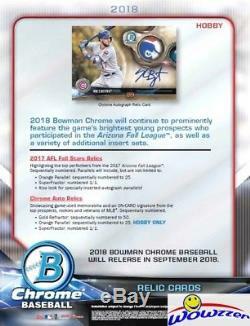 The item "2018 Bowman Chrome Baseball Factory Sealed 12 Box HOBBY CASE-24 AUTOGRAPHS" is in sale since Tuesday, August 14, 2018. This item is in the category "Sports Mem, Cards & Fan Shop\Sports Trading Cards\Baseball Cards".